Welcome to a wonderful week of inspiration brought to you by the MFT Challenge & Inspiration Team and Simple Stories! We're teaming up for a fantastic collaboration filled with summer fun and creativity. Simple Stories recently released four fun new collections: Summer Vibes, So Fancy, So Rad, and Stars & Stripes, and both our team and theirs will be melding these collections with the fine products from My Favorite Things. Let's take a look at two cards created with Simple Stories and My Favorite Things! 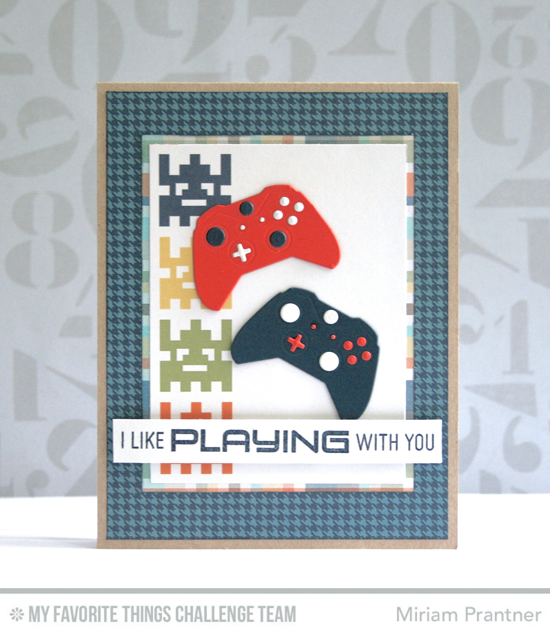 Miriam paired the So Rad collection with the Level Up stamp set and Game Controller Die-namics for this super cool card for a boy or any gamer. I bet there are a lot of guys who would totally DIG this card! I've been dreaming of summertime fun for quite awhile, and this card quite simply gives an indication of what I'll be doing in the months ahead! 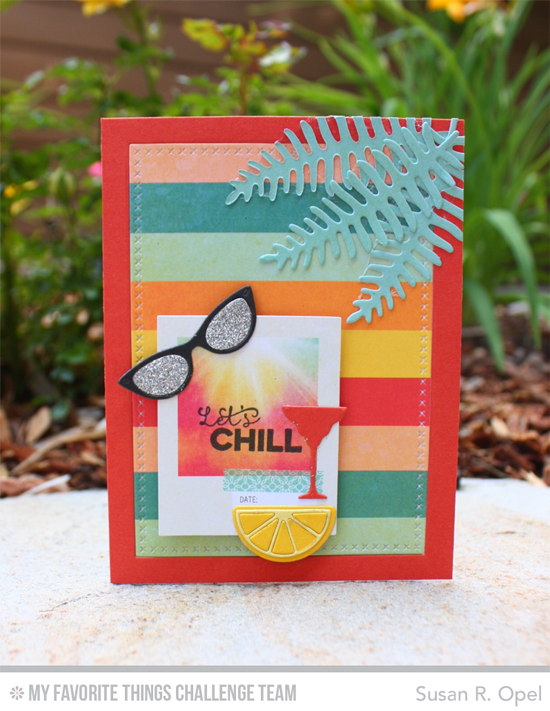 I paired the Summer Vibes collection from Simple Stories with an array of fun MFT icons in Die-namics form - Geek is Chic Glasses, Cheers Glass Charms, the lemon from Mason Jar Mug, and palm tree like leaves from Wild Greenery. Upon seeing this card, a friend said, "I want to live in that card." Yeah. Me, too. A collaboration like this wouldn't be complete without a fun give-away, now would it? Be sure to leave comments on all of our MFT/SS posts this week (June 1-6) on both of our blogs for your chance to win. 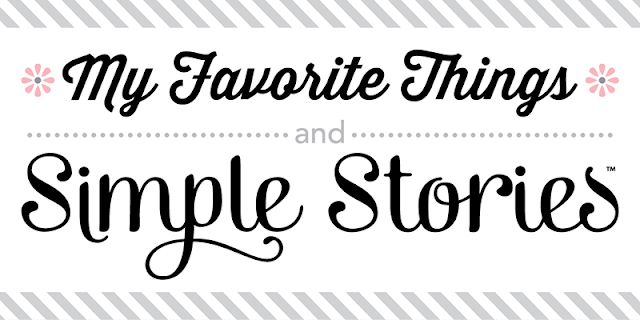 We will choose one winner to receive a $50 voucher from My Favorite Things and another winner will receive $50 worth of brand new product from Simple Stories. And that, my friends, ROCKS! Stop by the Simple Stories online properties and tell them we sent you! It's a wonderful place to follow, comment, pin, retweet, like, learn, and linger! And while you're at it, make sure to do the same with My Favorite Things, too! Now head on over to the Simple Stories blog to see how their design team combined our products with theirs! We love our friends at Simple Stories! Both of these are GORGEOUS! I especially love the colors on your card Susan!!! These cards are fantastic! Love this collaboration. Super fun cards!!! What a great collaboration! Fab cards ladies! love the color schemes! What a fun way to start the week! Cannot wait to see more! what a fun collaboration...love these great cards. Awesome cards! Looking forward to this collaboration of two great companies! Love this dynamic duo! Cheers! The combinations work so well together! Can't wait to try them. Fabulous projects using Simple Stories and MFT! I have a few gorgeous collections from Simple Stories...love their use of black!!! and why do I not have that Mug set???? ahhhh! These are awesome, so excited to see more! Such great cards!! The colors are so eye catching. Love them both!! Great cards, love the dimension with the die cuts! I love the combination of these stamps and dies with the Simple Stories papers! They pair perfectly! TFS! Great cards. Love the way the bright, fun patterns from Simple Stories pop the fabulous MFT stamps and dies! the shiny glasses and the stripes on the second card are fun. that orange slice really looks good. The perfect pair of MFT and SS!! Fantastic cards!! Fantastic collab! Heading over to see what Simple Stories has fir inspiration today. I love simple stories--this is a perfect pairing! Great cards made with this hook up of TWO AMAZING companies with excellent products - happy to see this and so fun!! What a great collaboration. Love these cards. These cards are AMAZING! They are all so bright and creative and really fresh! LOVE them all! Oh dear! These are funalicious cards and now more gorgeoulicious goodies have nose dived onto the "never ever gonna end" wish list! A combo of two great companies products!! perfect pairing of MFT and Simple Stories --- have loved BOTH for a long time!!! xoxo great inspiration!! Fun cards! My son would love the video game one. Thanks for the inspiration. Susan's card ROCKS!! Loving this collaboration!